For 50 years and counting, Rouhani Optical in Dubai, U.A.E has been a brand that has supplied unwavering commitment to quality and to your satisfaction. 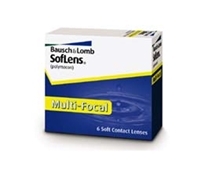 We offer all the top brands and styles in contact lenses and contact lens supplies. Whether you are buying prescription contact lenses in store, or conveniently ordering contacts online, or asking a question to one of our 24/7 online customer service representatives, we are dedicated to making you see our difference. We offer a broad range of contact lenses and contact lens supplies so you can find the perfect pair of contacts to fit your lifestyle. Whether you need toric contact lenses, colored contacts, or disposable contact lenses, we are sure to have what it is you need. We offer the best there is in contact lenses with brands like: Baush & Lomb, Biomedics, Biofinity, CIBA Vision, Cooper, Color Tone, Freshlook, and more. For your convenience, you can order contact lenses online with no hassle. We make ordering contacts online easy. Soft contacts are considered the most comfortable and are the most frequently prescribed type of contact lens. 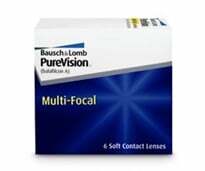 Soft contacts are available for all types of vision correction, including astigmatism and multi-focal needs. Wear them occasionally, every day, and even overnight. Daily-wear contacts can be worn for up to 18 hours, but they should be removed and cleaned nightly. Extended-wear contacts can be worn overnight. There are two different types of extended-wear contacts–those that can be worn consecutively for up to seven nights and those that can be worn for up to 30 nights. Daily disposable contacts (single use) can be worn for one day and then thrown away. Color-changing contacts or color-enhancing contacts can change the appearance of your eye color or just enhance it. Colored contacts can be prescribed even if vision correction is not needed. 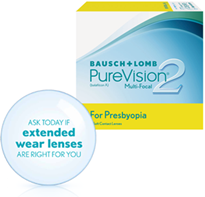 PureVision2 Multi-Focal Contact Lenses PureVision2 For Presbyopia lenses help maintain clear near, intermediate, and distance vision in real world conditions. These lenses also feature a thin lens and rounded edge for outstanding comfort. Enjoy high performance, long-lasting comfort and a healthier lens-wearing experience. The Avaira Vitality™ family lenses are created with a third generation silicone hydrogel material that allows high levels of oxygen to your eyes. Combined with high water content, this ensures that Avaira Vitality™ and Avaira Vitality™ toric are high performing, comfortable lenses. All Avaira Vitality™ family lenses offers Class 1 UV protection that blocks more than 90% UVA and 99% UVB offering greater protection for your eyes. Treat Yourself to Superior, Long-Lasting Comfort and Vision Performance. 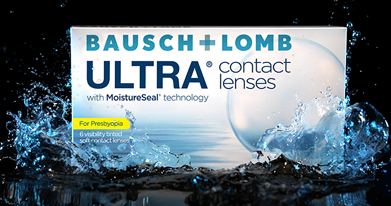 This contact lens provides superior comfort and vision performance that lets your eyes breathe and stay moist naturally. That is what you get with the CooperVision Biofinity® family of premium contact lenses. Thanks to a unique silicone hydrogel material, you can wear Biofinity lenses not just all day, but for up to six nights and seven days in a row. You will experience a long-lasting level of comfort that you may have never thought possible in contact lenses. Breathable Design That Locks in Moisture, Keeping Your Eyes Healthy and White. All Biofinity lenses feature our exclusive Aquaform® Technology. Proclear 1 day lenses have a superior aspheric optic design that is specifically adjusted for each power; so no matter what your prescription, your vision is refined for optimal sharpness. And if you are having trouble reading up close but don’t want to resort to bifocals, Proclear 1 day multifocal lenses will allow you to see near, far and everywhere in between. Biomedics® 38 lens holds its shape with no lens curling or roll up, giving you superior handling. It has a complex lens design for optimal movement, wearing comfort and lens fit. TRI-KOLOR lenses are all about going natural, bringing the best of nature’s colors to smoothly complement looks like never before. TRI-KOLOR has 8 dazzling colors inspired by the natural world, ensured to compliment every style. Choose from Gray, Blue, Hazel, Green, Blue Gray,Dark Green, Stylish Gray, and Stylish Brown. Manufactured using an innovative technique called Micropigmentation, TRI-KOLOR reduces the interaction of dyes with the eyes and ensures color integration and a natural iris effect. This unique technology found in TRI-KOLOR lenses is a process of sandwiching the dyes between the contact lens layers, greatly reducing toxicity associated with most colored lenses. For naturally beautiful dark or light eyes this contact lens offers you a wide range of desired looks–from subtle eye color enhancement to a bold, noticeable change. FreshLook® COLORS Contact Lenses These lenses give you the bold look you want. These lenses are an excellent choice to enhance light eyes.